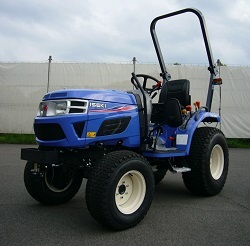 TM tractors provide excellent performance and high efficiency for professional and private users. The horsepower of 25, 23 and 20PS is selectable, and total 12 models in the line-up including transmission type. 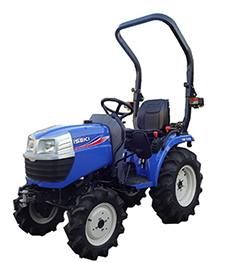 Mechanical transmission or HST and ROPS type Center or Rear mounting are available for their landscaping and agricultural applications. Depending on the usage of tractor, transmission and ROPS type are selectable either mechanical or HST and center or rear type. 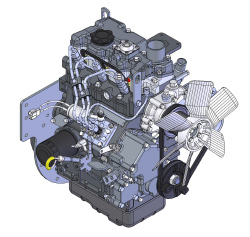 For various application, large displacement engine of 1.5 Liter is mounted on TM3267 and 1.1Liter engine is mounted on TM3247 and TM3217. 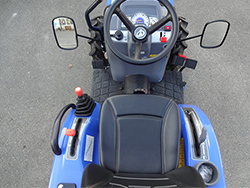 Main gear and range shift levers are located on left fender where is easy to access from operators' seat. Depending on purpose of customer, 2 types of transmission are available. Main gear has 4 speeds and sub gear has 2 ranges. Forward and reverse direction can be changed by shuttle lever. Cruise control / auto accelerator are equipped and sub gear has 3 ranges. Following functions are equipped on HST version for convenient operation. Operator can engage and disengage PTO independently from travelling. Depending on implements size, two modes PTO engagement is available. The height of 3-point linkage is set by position lever. 2 banks aux. hydraulic valves (selectable single or double acting) are equipped as standard for HST version. 1 banks aux. hydraulic valve (selectable single or double acting) is equipped as standard for mechanical transmission version. Platform is complete floating mount system including dash panel and steering post. It contributes to good isolation of noise and vibration for operator. 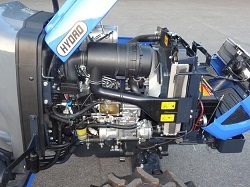 Variety of mower decks can be mounted on TM tractor. TM3185 is the most compact tractor in the model line-up. Solid transmission and robust engine offer varieties of working performance; cultivation, towing trailer, loader operation etc. 3 cylinders diesel engine has proper character for tractor. It has long stroke 761cc engine outputs enough torque from lower engine speed. The gear combinations are 6 forward and 2 reverse speed. The height of 3-point linkage is set by position lever which is much easier than up-down system. Aux. hydraulic valve (selectable single or double acting) can be equipped as option. Not only manual steering models but also power steering models are equipped to meet the demand of users. 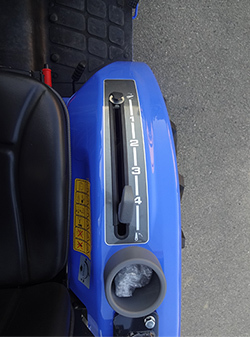 All levers and pedals are located suitable position. Operator can monitor working condition through the instrument panel which shows engine speed, fuel gauge, water temperature and other caution lamps in the instrument panel.